This is the perfect option if want to become a professional Makeup Artist, with supporting skills in hairdressing to make you more valuable in the industry. Study the basics of makeup artistry, perfecting the essentials of prepping skin and applying a range of makeup techniques. 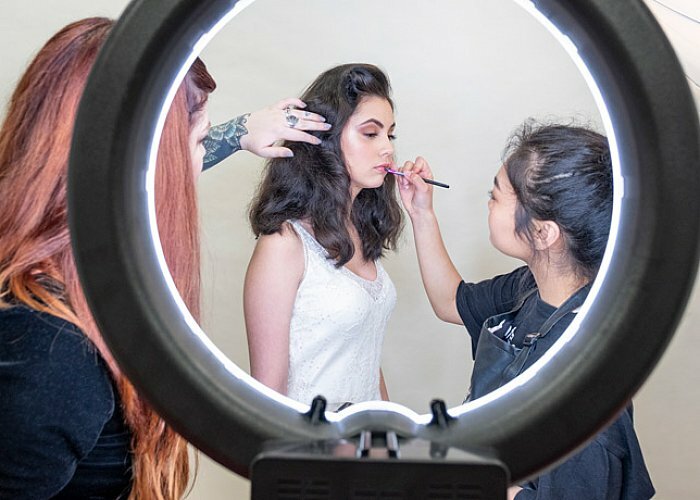 Continue to develop your MUA skills focusing on a broad base of makeup techniques as well as skills pre-production, production and continuity skills (film, TV, stage and media), workplace skills, and makeup and hair for catwalk and photography. You’ll also gain extra skills in hairstyling, beauty and how to market yourself as a freelancer. As part of your Level 4 course you will have the opportunity to work on a film set or stage production as part of the crew! You’ll work with the director/producer and cast as part of behind the scenes makeup crew. It will bring to life everything you’ve learned and add to your portfolio of work. This course is offered at our Auckland City and Auckland South Campuses. Demonstrate proficient use and understanding of spoken and written English. Have NCEA Level 1 (Year 11). You may be eligible for fees free study as part of the changes made by the Government! If so, the below fees and costs will not apply to you. Refer to the website www.feesfree.govt.nz to check and see if you are eligible. If you're eligible for fees free study you still need to apply for a Student Loan if you want to borrow course-related costs or living costs. You can apply through Studylink. Find out if you're eligible by calling StudyLink on Freephone 0800 88 99 00 or visit Studylink qualify to have your 2018 course fees paid up to a maximum of $12,000 by the government. If you are aged between 16 and 19 years, you may qualify for one of our Youth Guarantee fee-free spots.